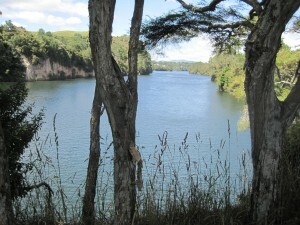 For our second day out on Nga Haerenga, we took on a different part of the network – the Waikato River Trails. 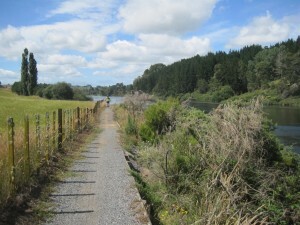 This is a recently completed 100km section of trails that follow the Waikato River between Atiamuri and Arapuni. Quite different to the Hauraki Trails, these tracks started out as dedicated walking tracks, rather than the typical railway conversion. This shows up clearly in places, and I was glad we took the full suspension mountain bikes. Many parts of the trails were smooth and wide, but there was plenty of steep bumpy ground, including a few places where pushing the bike was the only option – both uphill and downhill. 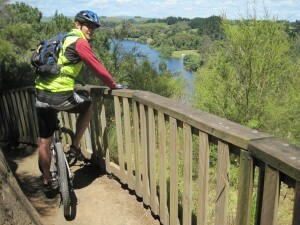 It’s a bit more of a drive from Auckland to the start of these trails, around 20km past Cambridge. I would have liked to do some riding near the Atiamuri end, but it would mean a pretty long day. Will have to do it as part of a weekend trip. 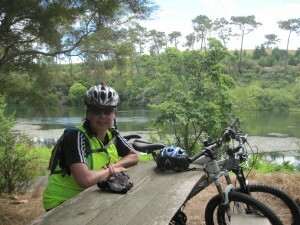 Instead we started at the Pokaiwhenua Bridge Carpark end, rode along the trails for a few hours, then looped back via Arapuni. While the Hauraki Trails had many, many cars, bikes and walkers in site, these trails were much quieter, and when we started, we were the only car in the carpark. 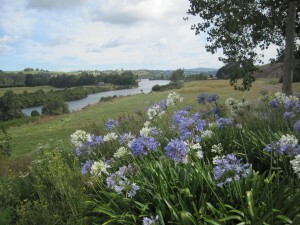 The first 4km or so were well away from the river, on a gravel path next to the road. Later that day we saw a large family group riding along this section – I would advise against this. You’re better off driving to Little Waipa Domain, parking there, and then starting on the trails at the point they get nice. From Little Waipa to Arapuni is quiet tracks beside the river, with a few short climbs, and a 500m boardwalk included. It’s generally flat, until you get close to Arapuni, at which point it climbs a long way, as the river level changes because of the hydro station. 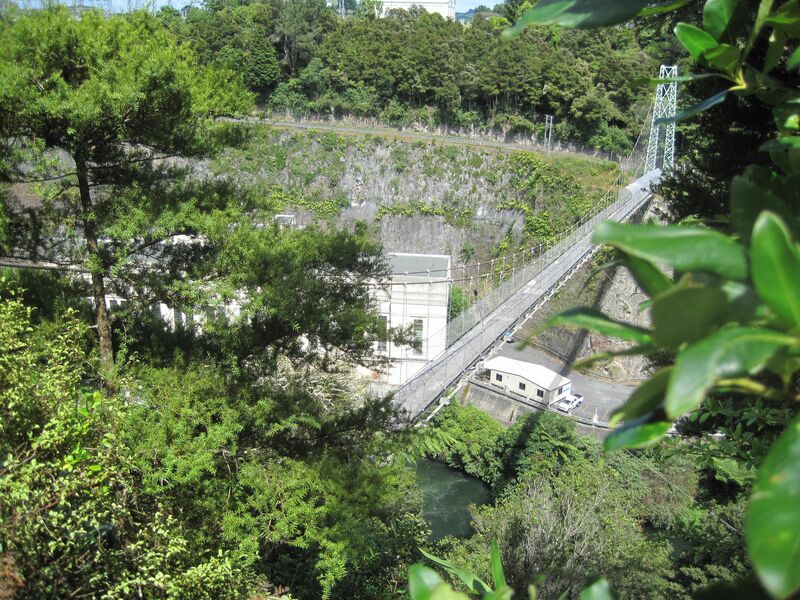 At Arapuni, you can head out across the suspension bridge, built in 1925 for workmen crossing from Arapuni village to work on the new power station. There’s something quite disconcerting about a long high bridge that waves up and down as you cross it. Wouldn’t want to be up there in high winds. And then…it got tough. 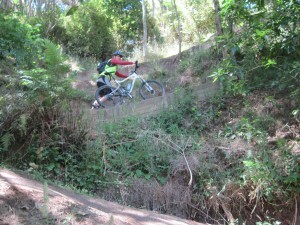 Not just a bit tricky, but slogs of pushing the bike uphill, through tight switchbacks. More of the same coming down. Not in the least insurmountable, but it would be tough if you had the whole family here for a gentle day out. No big drama, but don’t bring the kids here. We got to the camp ground at Jones Landing, and decided that would be far enough today. We’d been going for 2-2.5 hours, so it was time to turn around, to make sure we didn’t over-extend ourselves. That’s the problem with “out and back” rides. Rather than push our bikes back up over the steep sections, we took the alternative 8km road route back to Arapuni. 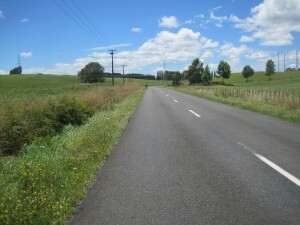 I wasn’t looking forward to riding on NZ roads, but these were quiet, predominantly downhill, with a tailwind, and fields full of wild flowers. I guess I can cope with that. We had a little look around Arapuni before heading home. 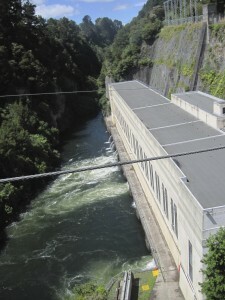 Arapuni village was built for the hydro dam workers. It’s now a quiet, pretty little town. From what I could make out, the old shops, mechanics and petrol stations had all closed down in the past. But now there’s signs of revival, with the Rhubarb Cafe opening up. Unfortunately they were on holiday the day we passed through, or they would have had a couple more customers. This sort of business opening up is the sort of thing that the cycle trails are meant to encourage – I hope they get sufficient custom to stay in business. They were the only business we saw in our whole day out, so they should get a few people stopping in. Instead of a cafe, our last stop for the day was picnic table by the river. Could be worse.